With only 4 players, USTA Southern California Intermediate's Bad Aces thrived at nationals. Meena Bennett (above) shined with a padded workload, going 5-3 in her matches. In Jr. Team Tennis, the loss of a player is always felt throughout the entire team, as each player’s contributions are pivotal to the team’s success. Losing three players just days before the Jr. Team Tennis National Championships is devastating. This became a reality for 18U Southern California Intermediate section winners, Team Bad Aces. Due to a California Interscholastic Federation (CIF) rule, three of the team’s girl’s players were unable to attend the Jr. 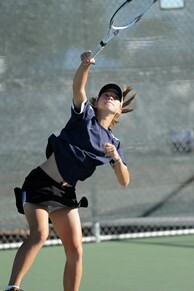 Team Tennis 18U National Championships in Surprise. Only days before the team was about to depart for Arizona, Reina Shintani, Kelley Nguyen and Giovanna Crivello were informed they would not be able to make the trip. It was hard news to accept, not only for the three who would be left behind, but also for the remaining members of the team. While most teams would have thrown in the towel and accepted its fate, Team Bad Aces did not want to go quietly. Knowing they would have to forfeit every girl’s doubles match, they made the trip, but that meant one player would shoulder a tremendous burden. Meena Bennett, the team’s sole female player left on the team, would end-up playing both girl’s singles as well as mixed doubles in every match. Brandon Wong would also be handed an increased workload, doubling-up on mixed doubles with Meena and competing in boy’s singles. "It’s been pretty hard at times, but I’ve still really enjoyed my time here," said Meena Bennett. Through Saturday, Meena has played exceptionally well compiling an overall record of 5-3. Her mixed doubles partner, Brandon Wong, has been flawless so far, going 8-0 through Saturday’s competition in mixed doubles and men’s singles. "It has definitely been pretty tiring playing both boy’s singles and mixed doubles this weekend, but I knew I had to pull through because our team needed the wins," Brandon said regarding his contributions throughout the tournament. The team’s remaining two players, Brandon Hamling and Kyron Griffith, have also played extremely well for their team. The boy’s doubles team is 3-1 through Saturday’s matches at boy’s doubles and both are expected to share time at mixed doubles with Meena Bennett for Sunday’s matches. "This experience has brought the four of us closer and I think it has made each of us stronger," said Brandon Hamling of his team’s performance in Surprise.